Several years ago a wonderful photographer at pmp, John Warren, took a beautiful photograph of a thatched-roof cottage during the summertime. It is located in Selworthy England. For me, this was quintessential England – perfect. Only when I saw the image I saw the cottage surrounded by snow. Edith Stillwell’s quote sums up my feeling about this special place ~ there is no place like the comfort of home. 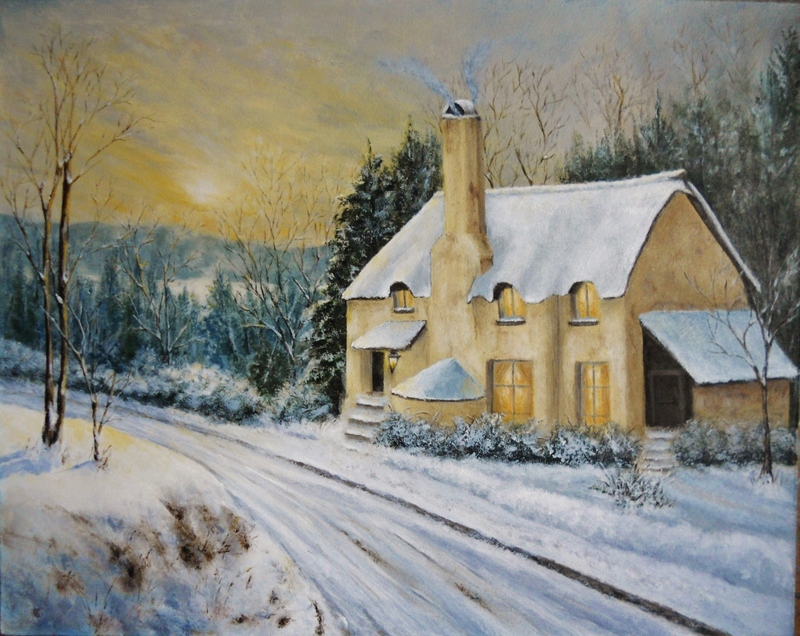 Cottage in the Winter, an acrylic (11×14) painting was done on a gesso prepared hardboard using Golden and Liquitex brand acrylics. I took some artistic license with the scene and added a few elements – snow (of course), a road, stairs for both the front and back entrances, and a distant lake. For the most part the cottage is as John presented it to us through his lens. This type of winter scene was a new undertaking for me, but I have to say it was a real joy to paint and express it as I saw in my mind’s eye. This entry was posted in Acrylic Paintings and tagged acrylic, art, cottage, fine art, painting, road, sky, snow, traditional, trees, winter. Bookmark the permalink. Love the warm colors and inviting mood, Mary. Thank you Jane – a little different subject for me, but a fun learning experience. Love the light from the windows and the pale sun. Great mood! Thank you so much Robert , I really appreciate hearing what appeals to you about this painting . Hope you are well, I look forward seeing your latest photographs . It’s always a joy to see your paintings.. i read the posts offline and have to wait til next time to see the image/loaded… oh my, it is a classic image for a christmas card greeting – one that the receivers would never toss into the trash, but savor every year when reunited with it! great work, amiga! You are so kind Lisa for your generous words and response to the painting , you know how to make my day . Thank you for always being present after this many years . Best wishes for a wonderful week ahead. Thank you Jo and you are 100% right – we are all doing better, the first time in a long time . I know you understand- thank you for taking the time to comment. And also for your encouraging feedback on the painting – means a lot . What an utterly charming painting! Thank you Fiona for your wonderful reaction to the painting. Hope you are well – I have missed your photography . Exquisite painting, Mary, congratulations. You capture the peace and comfort of the winter cottage so beautifully here. So good to see you Jet . Thank you as always for being present and so generous with your words of encouragement . Your “Cottage in the Winter” says everything you want it to say. I adore it. It’s a neo-classic, and should be in a gallery. Well, many of your works should be! You are the best dear Res, thank you for being so generous with your feedback on this painting – I always appreciate your visits. Can’t wait to see it !! What a wonderful surprise to see you Linda – often wondered how you have been. I’ll have to visit your website to see what you have been up too. Oh yes, can you believe it that I switched over to acrylics and I’m loving it. Still enjoy and like oil pastels, but this change has been welcomed – much to still learn. Thank you for your kind feedback on this painting. Take care my friend. Thank you so much Ashokbhatia – truly appreciate it. I just love this picture. I, too, would love to go there. Great work Mary! Hi cousin, great to hear from you. Thank you for being so kind, I love your response. I’d love to visit…sit by the warm fire in there…So beautiful, Mary! Wonderful to see you again Ann-Christine, thank you for your kind words on my latest painting. I loved your recent photography, it’s a joy whenever I pull up an image of yours. There is something magical that comes from your lens. Best wishes in 2019 – hope you all are well and Mom too. Always a treat to see you and your work, Mary! Best wishes for you as well – and thank you for mentioning mum. She is not that well, nothing else to expect. Hope you and your mother is OK! Thank you Ann-Christine – it’s been many years hasn’t it that we’ve been following each other. Where has the time gone. I understand about your Mum, same with mine. She is in a nursing home now with a staff who we couldn’t be more happy with – they are very good to her and we rest much better these days because of it. I understand – it is great to feel safe and good about it. Hugs to you and yours. This painting is beautiful, Mary. You’ve created such warmth and charm, it is so lovely. So nice to see your work and that you are working with acrylics. I look forward to seeing more of your creations in 2019. Yes, it’s been a long time. 2018 was super busy for me with family, my daughter graduating from college, moving my parents, and surgery on my Achilles tendon. Things have hopefully settled down, and I plan to spend more time painting and getting back to blogging. It’s been great to follow your creative path on WP you have had an amazing journey so far. I’m hoping for lots of painting time for both of us in 2019! Thank you so much Sylvia for your kind response to this painting – it gave me just the right challenges I was looking for. Glad you enjoyed the scene. Wow! I am once again stunned by your huge talent. Great to see you Dorann and thank you for making this rainy day brighter. Thanks for your compliment and hope that your new family addition is enjoying her new life – being oh so spoiled!! What can one say – it’s beautiful. You take all the artistic license you want because your finished product would be coveted on anyone’s wall to admire day in and day out. You know how to get someone’s day started just right Judy. Thank you so much for your generous comment and compliment. You guys know all too well how cold the long winter days can be, but a little fire goes a long ways to bringing in some warmth. Glad you enjoyed the painting. Mary, this is Beautiful Winter-themed Artwork! It almost could be a scene from some place in rural Nebraska (I’m originally from NE). Wonderful Nawfal and I can appreciate your response. NE can really get some colorful, yet blustery winter days. Really enjoyed reading your comment. Looking forward to seeing your latest through your lens. Thank you, Mary. Always enjoy seeing your art . Great reaction Derrick, appreciate it very much!! Aren’t you looking forward to seeing some of the gorgeous colors that your gardens display – our first daffodil just opened!! I can imagine myself going down that street and passing this cottage, wondering what the family inside was doing. Awesome GP and exactly the kind of reaction that I was hoping for. Really appreciate your response – thank you so much. Hi Holly, great to see you – hope you are well. I’m looking forward to reading your latest writing. Thank you for your kind comment and visit. I was so delighted to find you and your artwork back here. Still doing awesome art! Your painting is absolutely gorgeous and the quote is perfect. Thanks for sharing your talent with us, Mary! I’m hoping spring is around the corner, but sadly, I think we’ve still got some cold days ahead. Thank you so much Jill for your generous reaction – glad you enjoyed the quote as well, thought that Edith said it just right. Have a great day!! Wonderful to see you Gallivanta – best wishes for peace and a healthy 2019. Saw that you guys were having quite the heat this summer. Thank you always for visiting and leaving such a nice comment – very much appreciated.